You can buy Warframe Mobilize Pack cd key for PC in digital download version at the best price from our selection of the best online gaming stores! This product is a CD key or digital serial for Warframe Mobilize Pack wich you will must activated through the Steam games platform. After buying Warframe Mobilize Pack cd key, you will receive by email an activation code or serial, that you need to enter into your Steam account to proceed with the download of this game. 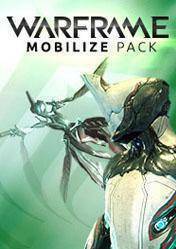 Mobilize Warframe Pack is a package of content for the game Warframe, including: 300 Platinum coins to buy new Warframes, Archwings, weapons, pets and more. 30,000 credits to help improve our arsenal. 5 random Mods cards to update our inventory instantly. It instantly unblocked Exilus progress Parkour Mod slot. Also includes: Affinity Booster and Credit Booster to quickly level our Warframe, Archwing and weapons for 3 days. A great help for both new and veteran players in the universe of Warframe. Please review all information of each store before making your purchase, as well as the version of the game and methods of download the title. In case of any doubt (about the version, download forms, ...) get in touch with the store support for more information about the product. There are no comments yet about Warframe Mobilize Pack . You can be the first one! Warframe Rank 8 Meistern für Anfänger TOP Meisterschaft Rank 8 2017 GERMAN Youtuber in Ausbildung !